I went to Twin Mountain, NH this evening and picked these up for the Pathfinders. They were posted on Craigslist a couple of weeks ago, and I only contacted the owner yesterday evening. I was surprised they still had them. Twin Mountain is remote enough that most people were not willing to make the drive (it was 75 miles one-way for me). When I saw these canoes I wanted them soooo bad! One of them looks to be exactly the same type as the one I built in 1998 (a Chestnut Prospector). They were asking $350 each, or $900 for all three. I don’t have $900 to spare, and neither does the Pathfinder Club. 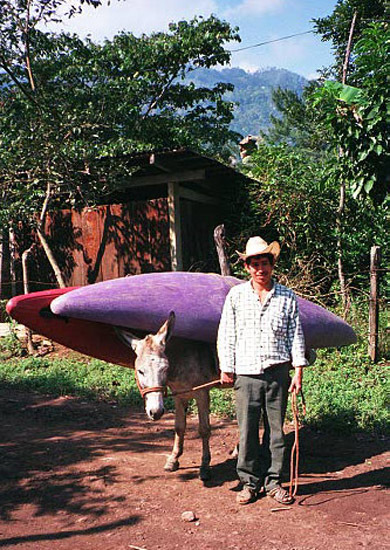 Yeah – why else would I want three canoes? I mentioned the listing to a friend of mine at work, and he made the inspired suggestion that I ask them to donate one or more of them, and maybe the club could afford the others. He offered to kick in $100. I couldn’t see anything wrong with his plan, so I acted on it. The owners agreed to donate one, and I would buy the other two. I asked the church board to weigh in on this decision, as $700 is not insignificant. They approved, so I sprung into action. As soon as I got home, I had to swap out the bars and clips on my roof rack. I needed the 6-foot bars, and I had the clips on there that fit Va’s car rather than mine. Unfortunately, I used the wrong sized hex wrench on the rack several years ago, and that stripped out one of the cams. So every time I swap racks, it gets more stripped. As a result, it took me almost an hour to get the rack in the right configuration and on my car. I need to get a new roof rack. I made a couple of sandwiches and ate them in the car on the way to Twin Mountain. 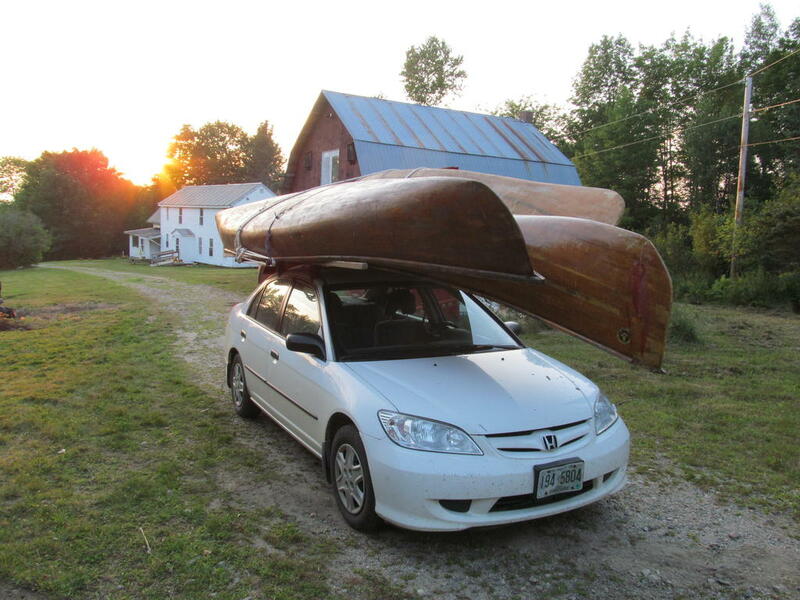 The (former) owner of the canoes was surprised when I drove up in a Civic. I have seen worse though. On the Internet anyhow. These canoes are going to need some work. The big one (in the center) is a monster measuring over 19 feet long, and nearly four feet abeam. It is in the best shape and could be paddled right now. I will clean it out and probably lower the seats (they are bolted straight onto the gunwales with no spacers). The outwales don’t make it all the way to the stem either, so I will need to address that too eventually. And there’s something like melted wax (or plastic) all over the rear deck and hull. The second one is in fairly decent shape too, but it needs the inwales replaced. The thwart is beautifully carved, but it was glued in with a half gallon of carpenters glue. And that joint didn’t hold (unsurprisingly). The third canoe needs some new decks and a lot of fiberglass work. It has been inexpertly patched several times. I will take a lot to make it beautiful again, but it won’t take a lot to make it river-worthy. But the first order of business will be to construct a covered rack for them. I think I know what I’ll be doing Sunday. I’ve been thinking about getting a small kayak. Something small and light enough to handle alone that I can paddle around beaver ponds with. Looks like you’ve got some winter projects! Yes. I may have to clean out a spot in the basement so I’ll have a semi-heated area to work. Now that I’m (nearly) finished insulating in the attic, I can move the attic junk out of the basement back to the attic. I think you got a lot of canoe for the money. Also a lot of work. Fortunately, it’s the kind of work I very much enjoy. I would also enjoy that. Once I bought an old wooden boat and renovated it. Enjoyed the task and the results! Wooden boats have a charm that cannot be touched by ABS or fiberglass. The smell of wood shavings, and shaping wood with your own hands are two of the greatest pleasures in life. I have neglected that discipline for far too long. Score! Those look beautiful. I bet the sellers delighted in knowing that lots o’ kids will enjoy them. They seemed pretty pleased about that. They had found these in a barn on the farm they bought, and are working to turn it back into a real farm.